Sometimes things really surprise me. This here ginger-pear quick bread is one of those such things. I had considered choosing it a few months back for one of my Project Pastry Queen choices but was a little nervous about the recipe. A pear quick bread sounded great but I was a little leery about the fresh ginger. So I passed it over and went with the Brie and Brisket Quesadillas instead. But this week, this recipe came up as Aliza’s choice and I’m so SO glad I made it over the weekend! The fresh ginger and pears bake up beautifully in this quick bread (really quick – 10 minutes to prep!) and with a hint of sweetness, they combine into a lovely flavor that I didn’t expect to fall for as much as I did. And I definitely didn’t expect Kyle to love this bread as much as he did! I considered serving the bread with a dollop of cinnamon whipped cream but found that it was just so moist and tender that no accompaniments were needed. Lucky for me, I baked up the batter in two 8″ loaf pans rather than one 9″ so I’ve got an extra loaf in the freezer for another day. I love being able to just pull out a loaf of quick bread from the freezer in the morning before work and have it ready to eat for dessert that night! As mentioned, Aliza from Baker by Night chose this recipe and she has the full recipe posted. Next week we’re making Emergency Fruit Crostatas! 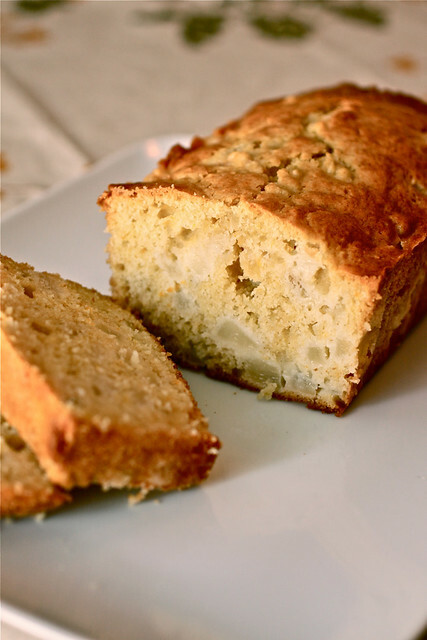 I’m typically not a fan of fresh ginger but I do love the idea of a pear quick bread. Your bread looks delicious! After seeing your picture, I had to run to the kitchen and get another slice. Over half of my loaf is gone! Oops… I think next time I will make 2 smaller loaves like you did, keeping one in the freezer would definitely keep me from eating too much of it! When I make quick-bread, I usually make banana bread, but this flavor combo sounds fantastic. Tara, this looks marvelous! I love everything with pears, and this bread looks right up my alley! Tara, This sounds amazing! Yum!